Focus, Perseverance and Courage From You - Is What is Need in the Business World Now. There is a profound sense of uncertainty spiraling in business at the moment. A phenomenal amount has happened in a week, daily we are feeling the dark winds of change. It is so easy to be distracted; in the technology world the big buzz-word is ‘disruptive technology’. We can easily see how this coined phrase can be applied across all spheres. Yes, we are living in very disruptive times from Donald Trump’s fast decision making to the unknown implications of Brexit to the upheaval in our politics. We may feel that we have little impact on these ‘disruptive times’ however; I fundamentally believe we can play our part in maintaining stability in our own way. In controlling what is controllable enables us to provide stability, focus and confidence for ourselves, our families, our staff, our suppliers and our clients. The One Thing You Can Control as a business owner is You. So I challenge you to Take Charge of the things You can Control – As the lack of control, clarity & leadership is costing you money and years of your life. Never has there been a time for you to focus, persevere and to have courage in essence to really dig deep. Starting today, business owner, it is an important time to take control of the things in your business within your control. If you know me, I am definitely not trying to give you a big head. I’m really not kidding. But Your business fundamentally revolves around you completely. From your perspective, you’re the main character in your own movie, and know if often feels like there are a billion movies all playing at once. Whatever plot or ending you want, everything starts with you. Sure, there are external factors you can’t control, like the Donald Trump, or Euro market conditions, or government regulation. But, there is one thing you can control, and yup, you guessed it – it’s You. My first and most important task, when working with business owners is to correctly define clear and scalable foundations based on their business vision into a long-term action plan showcasing achievable timescales and milestones. Your business foundations are what keeps your company up. Without it, you would sink and fall. Everything is built upon your foundation your vision. 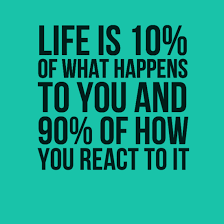 “Life is 10% of What Happens to You and 90% of How You React to It” – You control how you respond to everything around you. Now, if you agree with my claim that you’re the leading actor/actress in your own movie, you already know that some movies get more success than others. What this means to us, is that we all need to know our character. We all need to know what our role is. The good news is that not only are you the main character, you’re also the director, which means you have complete freedom to define who you are. Unfortunately, for some they have no idea what it truly means to be business owner. Yes, ultimately you are accountable for everything at my company. For some of my clients, they have hit a plateau and they are lost. Business like life is a series of transitions and as a business owner you have to take time to reassess the most important job description in the company. This clarity without doubt effects your bottom-line enormously. So get up, keep your vision clear, grow your profits, grow your team, grow your sales, be bold, be courageous and most importantly control the things within your business, which you can control. Let’s do this together, start today with my One Day Intensive. A full day intensive designed to either re-energise your business plan, sales plan or project idea, or take your existing project to the next level. “As a business strategist, consultant & coach, I help successful but overwhelmed business leaders gain clarity, extraordinary growth, increased profits, and exceptional quality of life" Ann Rodgers, Award Winning Director and founder of Infinite People Solutions. Ann's 15 years of business consultancy and coaching experience as well as her successful entrepreneurial career, enables her to really add value and bring fresh perspectives and approaches to her clients.